In reading about ways to record to tapeless on an XL-H1a, it seems like the fs-cf pro could be a good and not-too-expensive solution, but I haven't found much written about it since it was first introduced. Has this become an accepted solution? I gather I wouldn't get the benefit of bypassing compression offered by Nono Flash or Ki Pro Mini because of the outputs on the XL-H1a. I have a FS-CF Pro that I use with my Canon XHA1 and HV20 cams. The only thing to consider is if you are shooting in QuickTime format, you must have a current version of Final Cut Pro. I am not yet experienced enough with ClipWrap to convert it to a format that iMovie or Final Cut Express will read. Adobe Premier Elements 9 will read the files saved in m2t format with no problems. Have you found that the FS-CF Pro was worth the extra $? I have an XH-A1 and am just a couple of days away from ordering either the CF Pro or H200 pro. The big advantage I have read is the ability to do 30F. Any other great benefits of the CF with the XH? Everyone's out of stock now on the CF, but the H200's can be found, and more affordably. For the type of shooting I do (oral history interviews, aviation air-ground/air-air documenting) I have not yet put the -CF Pro preview mode to much use. I keep shooting until the battery is almost totally exhausted or the 32GB CF card (about 2h+45m) is full, then download to a laptop. I purchased the -CF Pro to have the flexibility to review when the need arises. I really do like the unit. The ability to download the file(s) via Firewire 800 saves a lot of time compared to the real time tape downloads. I don't anticipate purchasing new cameras anytime soon, so the purchase of the -CF Pro was a lower cost solution to replacing tape. I usually record to both the CF card and tape for the backup it provides. I see 128GB Lexar CF cards are selling for $245 now, so the savings continue to add up. 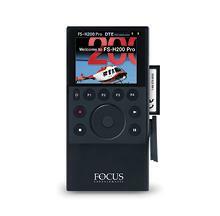 Adorama still has a few of the standard FS-CF units left.... but they are running scarce! Ah, so the non-Pro version of the CF is being phased out, I am guessing, not the whole CF category. All of the online docs I can find on the H200 do not show the ability to record in 30F, which is about all I ever use. David, it looks like you are using the non-pro version... what format are you recording in, and can it do 30F? I am PC-based (Sony Vegas Pro 10), so m2t's or MOV's work just fine. I am currently using the xh with a FS4-HD that has started glitching a bit; luckily, I use tape backups, which saved me on my last shoot. The m2t's have always imported just fine, but I am now working with another editor with FCP, so I have to re-encode to MOV's for his future use. My main goal is to record at 30F MOV, and it looks like the CF series is all that does that? Just trying to find the cheapest way to get that format. I have it set to QT and HDV, and it takes on the format I have entered on my XHA1S, I use 24F; but it will do 30F as well. From Canon: the recorder supports 1080 24F, 25F and 30F, 50i and 60i frame rates, both in QuickTime and M2T file formats; Basically matches the Canon XH formats. I don't like the inability of being able to add metadata.... basically drop and drag clips over, they are ready to use. They just don't allow you to add any info. Perhaps if I turned off the wrap thing and capture as M2T clips, I may be able to enter info through FCP log and transfer; but thats the Mac thing. I probably will send this back and go with the Pro version. Derek, I just tried shooting some clips as M2T, and FCP still doesn't recognize them when trying to Log and Transfer. How does Vegas handle metadata info? I have an old FS4-HD also, I am considering dropping a SSD drive in it; but not sure what to do about the battery. I guess it is a little limited on frame rates. Much thanks for the in-depth info, David! I haven't had a need to use Vegas' metadata, until now. We're doing more corp shoots where, instead of manually logging good takes, it might be nice to build it in to the clips. The ability of both the CF & CF Pro to do 1080/30F is a deal maker for me; now I just have to decide if the on-screen clip playback ability and couple of other goodies on the pro are worth the extra few hundred+. I also saw your other thread New version of FS-H200 Pro? 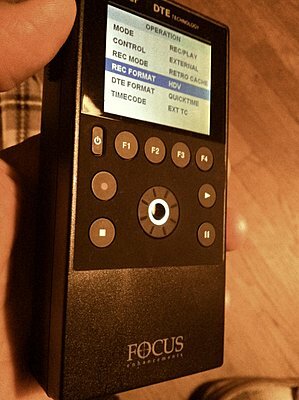 mentioning Focus will is upgrading to an iPod type of scroll wheel. One would imagine the FS-CF Pro would get the same upgrade soon... there must be a reason for the rapid changeover. Well Derek, if the playback isn't that big of an issue, you may find the non-pro version a plus. But I'm with you on the metadata info, I do a number of promos, and it would be so nice to at least log some basic info in advance! I've attached a picture of the unit I have. It does appear to have the scroll wheel; much like the earlier iPods. East to navigate, much more than the FS-4HD! Last edited by Derek Choice; April 2nd, 2011 at 08:11 PM. I would think it would be an adjustment to remember to hit the FS record button instead of or in addition to the DV record start on the XH. 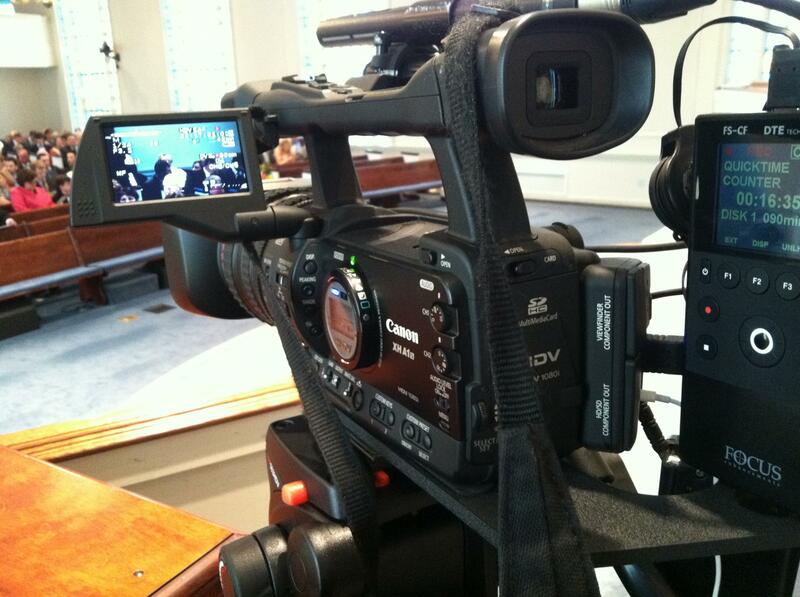 It's a lot cheaper than buying the FS300, for example, but it would be something to get used to. What's that experience like? The FS-CF Pro seems to add some new format options also (DV Raw?). Not sure how to change this when recording. I had it set to ext; but needed to change a tape without stopping recording. Couldn't figure it out. Will have to red the manual a little more. Do you set the FC to external mode or the XH? Tim Trott: So they operate independently such that the XH-A1 record start button does not control the FS? Yeah Tim, The Sony HVR MRC1K DTE Recorder allowed you to toggle this control while rolling. I imagine there may be something like that on the FS-CF. BTW, I use the BEC-DVCAMB-HD bracket to mount the FS-CF on my Canon XHA1S (Sony EX1 - EX3 Bracket Panasonic HVX200 High Definition Video Camera Accessories The BEC Group it makes it a little right side heavy; but a very solid braket, adding weight towards the back of the camera. I may try to counterbalance it a little.... somehow!